Siberian Huskies are surprisingly good at taking care of themselves, licking themselves clean much like cats. However they do need particular attention paid to the coat when they molt, plus a regular grooming session once a week can help keep your Husky puppy looking fabulous. And who doesn’t want a fabulous looking Husky? It is really important to start grooming Siberian Huskies early in puppy stage. Their coats develop within weeks of birth. Also in the first 12 weeks of their life they are most accommodating in learning new behaviors and routines that will last a lifetime. However if you have adopted a dog that has grown out of it’s younger puppy stage, it is never too late to start! Once a week, for the life of the dog, you should do some basic grooming. It is important to stand the dog up to get it used to being groomed in this fashion. A standing dog makes it much easier for you to get through your grooming tasks efficiently and effectively. A weekly brush of the coat will help keep it neat and tidy, and dislodge any loose hairs or dirt that might be stuck in there. Brushing also helps avoid matting. Matting is likely to occur if you don’t brush your dog, and he or she likes getting wet in the rain, snow and ice. The molting (hair shedding) process usually happens once a year as the weather starts to warm up in spring and summer. Some dogs might shed twice a year, and some none at all, depending on the environment. A young Husky puppy is unlikely to fully shed in it’s first summer but might drop a few hairs around. When your puppy reaches 10-14 months old a major shedding will occur as the “baby” coat makes way for a thicker adult coat. The molting process will typically start with a few sprinkles of fur dropping loose before the real action begins. A Siberian Husky will shed a lot of hair. A LOT. The bigger the Husky is, the more hair it will shed. If you have ever seen how much wool a sheared sheep gives, you are on the right track. You will need out your Husky with some brushing. You can start with a larger, wide-toothed comb and brush out as much loose hair all over the body. Look for a comb with rounded teeth to avoid scratching the dog’s skin. You can use a finer-toothed comb for the head and neck areas where the fur is thinner. Most owners will only give their dog a bath once a year, after shedding. You could get your dog professionally washed, or you could take your dog down to a local hydro-bath to do it yourself. If you have the space you can do it at home – just make sure you use a shampoo formulated for pets and follow the directions on the bottle. After washing you may towel-dry your Husky and, if you feel it is necessary, a light blow dry with a hairdryer at it’s weakest heat setting. After the dog is try this is a great time to apply any flea, tick, and other parasite controls that dogs in your area require. For the eyes simply grab a damp cloth to wipe the area clean of excretions, dirt, etc. For the ears check once a month for signs of infection, mites, or other parasites. Any redness, discharge, or unusual odor will require a visit to the vet to check it out. There are also ear-cleaning lotions available that you can apply yourself if you want your Husky to look its best. Nail clipping need only be done from time to time. Once a month have a look and see if the nails need a trim. It really depends on the environment your dog is in to whether nails are under control or not. Like all grooming, the earlier you start the better. You can start clipping nails of a puppy at just 4 weeks old to help it get used to the sensation of the clippers. Over-washing your Siberian Husky is a no-no. Oils secreted by the skin help protect the dog. Bathing will wash those oils away. A bath just once or twice a year is fine, or of course if your dog finds its way in to something really messy and needs a helping hand. Shaving the coat of your Husky is also to be avoided. The outer coat helps repel water, whilst the inner softer coat insulates the dog from both the heat and the cold. Let the coat do its job and you will have a happy Husky. Finally, like all pets, clipping whiskers is not necessary. The dog doesn’t like it. Your lovely young cute Siberian Husky puppy is going to molt. You can not avoid it, so get used to it! Importantly, start with some basic grooming as early as possible so that your puppy gets used to being handled. 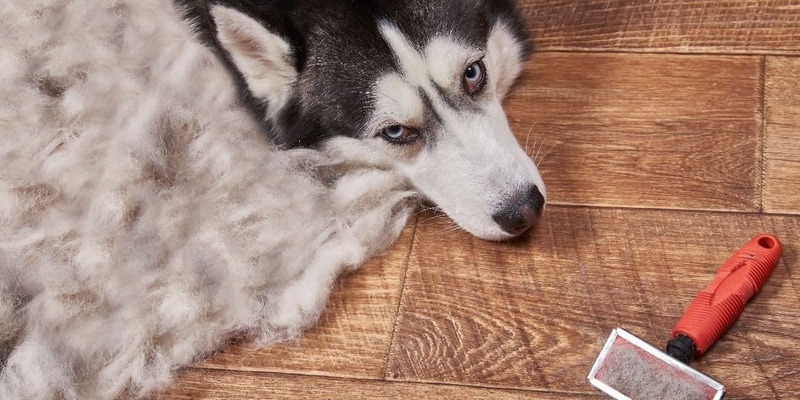 You might have to brush and vacuum up the hair left behind, but think of it this way: at the end of the molting process you are going to have a dog with a lovely coat to protect him or her for months!